I’m sure many of you like me, are heartbroken over the recent Steelers loss. Now that the heartache has subsided, I’ve decided to start my fashion planning for next season! I have been rocking the same Athletichic outfit for the past few season, and I think the 2012 season is time for a change! I have to admit I am tempted to wait and see the Nike uniforms debuting this season before I make any decisions, but this adorable reversible jersey from Charm 4 Luck may be too cute to pass up! Two jerseys in one + plus shimmer = love!! How about you? Are you starting over next season? 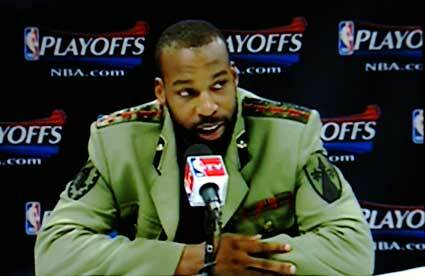 Baron Davis Saving Menswear as We Know It!? So I realize this somewhat old news, but please forgive me as I am not really an NBA fan, however, there was no way I could let this go by without covering it on my blog. My favorite NBA player, Baron Davis (based solely on his style), was very busy during the lockout. Doing what you ask? Mr. Davis was working on putting together a documentary about the decline of style in menswear, a subject near and dear to my heart. The Wall Street Journal talked to him about it (via SLAM). I was delighted to hear he shares my feelings on Uggs! My hope is that his documentary will be successful like his others, and that men will listen, considering most take sports to heart and worship many of these athletes. I plan on keep tabs on the production of this film, and will update you, because I personally can’t wait! I knew today would be a good day because I decided to layer my cashmere J Crew dress with a vintage sweater: http://sparkleeveryday.tumblr.com/post/15619349669/decided-this-cashmere-beaded-dress-from-j-crew. It just started off right. This sealed the deal: https://twitter.com/#!/athletichic/status/156786739539742721. Mr Antonio Brown retweeting me. So I have amazing co-workers, I could tell you a million reasons why..instead I’ll show you Anna’s adorbs Steelers outfit instead…..
Love the way she layered her look and wasn’t afraid to do a dressier look with her black and golden yellow. Happy 2012! I hope you all had a wonderful holiday season and new year! I’m here to check in on all of you, AND to let you know about this great new site. Pay Me Fantasy. It’s a genious idea! payment, and forget having to use Excel spreadsheets or post-its to track your league’s fees. Instead of being asked by team managers, “Where is my money?”, pay prizes out immediately! Check it out, I have a feeling it will make your life a lot easier!